Will we need to go much faster than this? If you take any serious amount of photos in RAW format or shoot lots of video footage at, say, 4K resolution, then you need a speedy SD card. Being a kingpin of the memory business for a long time, Sony knows this better than most, and therefore has unveiled the “world’s fastest” SD card: the SF-G Series. The firm chalks up this arguably massive increase to “unique firmware,” and … that’s it. 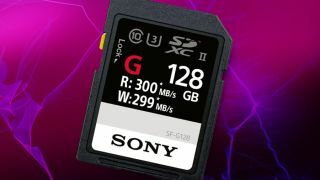 While Sony is keeping mum on exactly how it crafted the speediest SD card yet, it has released a bunch more qualifying information you should know before picking up one of these bad boys. For starters, make sure your camera(s) and other hardware support cards rocking the UHS (Ultra High Speed) II classification. Second, Sony is releasing three versions of the card: a 32GB SDHC model as well as 64GB and 128GB SDXC models. And, finally, Sony will also release a compatible, high-speed SD card reader, the MRW-S1, with a USB 3.1 interface supporting UHS II for faster PC transfers. Sony has yet to release pricing information – though, knowing Sony, expect to pay a considerable sum for this kind of speed when the cards launch this spring. Also, not to look a gift horse in the mouth, but could we use some more capacious cards?